Paper presented at the EDEN Annual Global Meeting 2016 in Budapest, Hungary from 15-17 June 2016. Emerging technologies for teaching and learning have made it possible to create environments, scenarios and virtual patients that simulate clinical practices in order to promote the development of skills and knowledge in healthcare education (Lewis et al., 2005; Hogan, Sabri, & Kapralos, 2007). These simulations are seen as educational techniques that bring interactivity and immersion into the learning process, allowing the recreation of clinical experiences without the risk of causing harm to patients (Maran & Glavin, 2003). Other known advantage is the possibility learners have to practice an unlimited number of times a procedure or technique until correct realization, before applying it in real-world scenarios (Rey et al., 2006). Virtual reality (VR) and Augmented reality (AR) are examples of emerging technologies for teaching and learning that allow the creation of digitally enhanced learning environments. These technologies are expected to have an impact in education, as highlighted by the Horizon report for Higher Education in 2010, 2011, and most recently in 2016 (Johnson et al., 2010, 2011, 2016). Regarding healthcare education, several studies indicate the positive effect of AR and VR in developing decision making skills and practical procedures using virtual simulators, with a higher impact on non-experienced participants (Zhu et al., 2014). However, using VR in healthcare education can be a debatable approach since it immerses learners in a synthetic environment, enabling them to see the surrounding real-world. Acting in a different environment from which learners will have to act in real life scenarios is another concern to take into account. Jorge, Nelson; Morgado, Lina; Gaspar, Pedro (2016). Augmented Learning Environment for wound care simulation in Teixeira, Szucs and Mazar (2016). Conference Proceedings EDEN 2016 Annual Conference. Page 256- 264. ISBN 978-615-5511-10-3. License CC-BY 4.0. Paper presented at the EDEN Annual Global Meeting 2016 in Budapest, Hungary from 15-17 June 2016. 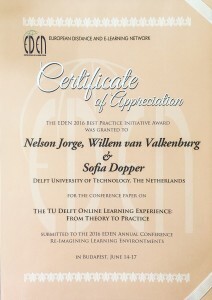 At the conference Gala Dinner the paper received the EDEN 2016 Best Practice Initiative Award. In 2014 TU Delft started an innovation programme to educate the world and improve quality of education based on online learning. The programme included open (OpenCourseWare and MOOCs) and online (Professional Education, Bachelor and Master) courses. Lecturers of TU Delft have shared their knowledge in MOOCs with more than 750,000 learners around the world. Next to the open courses, more than 800 learners enrolled in our online courses. Adopting new instructional strategies based on online learning elements has had a very positive impact in TU Delft’s overall education, benefiting traditional on campus education and contributing to the changing need in educating engineers (Kamp, 2014). Naturally, blended learning has arisen on campus, where online learning materials are reused in a flipped classroom approach with very positive results: higher completion rates, higher average grade, more flexibility for students to interact with the course material and more flexibility for teachers in choosing which elements to include in the interactive classroom sessions (van Valkenburg, 2015). 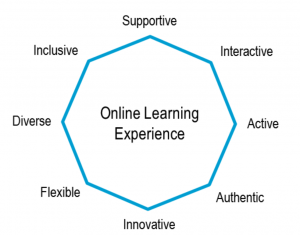 The development of TU Delft online courses is based on the Online Learning Experience (OLE), a pedagogical model that supports the development of our courses and strives for increasing quality. The creation of the OLE was an important step for TU Delft, contributing to the development of online courses in a more systematic and consistent way, guiding all course development teams through the realisation of several shared educational principles. 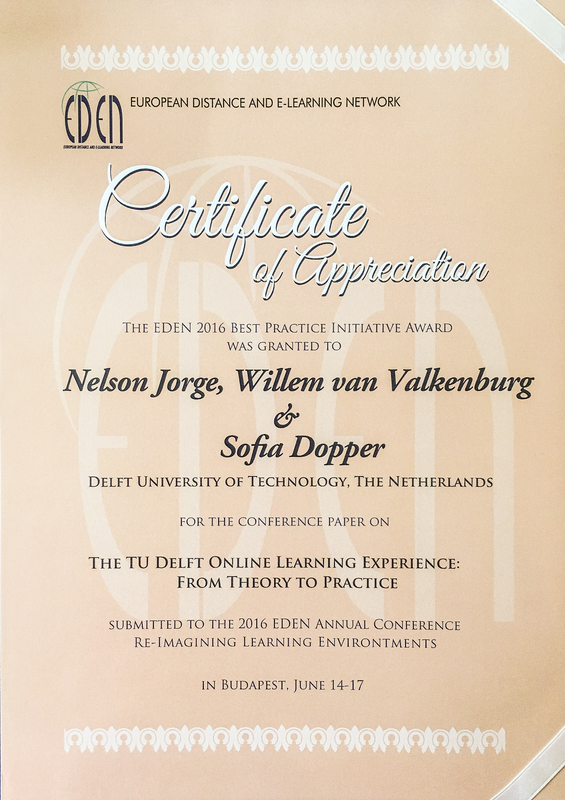 Last year, when we presented the OLE at the 2015 EDEN Conference in Barcelona, we were still at an early stage of its development, collecting fundamental background to support it and feedback from online learning experts. Although we only had a collection of ideas translated into 8 principles, it was clear that the model needed to be flexible in order to accommodate many educational scenarios that coexist among TU Delft’s Faculties, but with a clear and useful purpose to help improve the quality of our online education (Jorge, Dopper & van Valkenburg, 2015). This paper describes how the OLE is applied in practice.The main goal of the OLE is to improve the quality of our online education by setting course design and development principles to support course teams. At the same time, the OLE can be used as a tool to promote reflection before the course starts to set expectations, and in the end to evaluate and plan improvements for the next run. In the next sections we’ll describe the OLE in both ways – as course design principles (guidelines) and as a tool (the radar graph). This paper was presented at the EDEN 2015 conference in Barcelona from 9-12 June 2015 by Nelson Jorge, Sofia Dopper and Willem van Valkenburg.